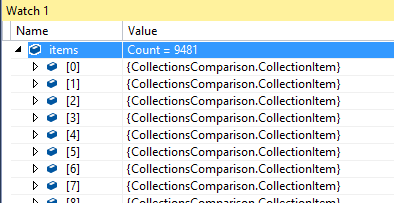 Working with Visual Studio’s Watch window is relatively easy when you’re working with small, flat collections – but understanding and finding data in complex collections with complex objects and/or thousands of items is nearly impossible! And then you find yourself spending your time expanding a million nodes and copying bits of information onto a piece of paper, just so that you can compare different bits of data and find out what state your code has changed. It’s a nightmare! After a collection of items were marked for removal, some items from that collection were left in the application’s memory – inside the application’s HashSet. The hard part was figuring what happened to those items! Thus, my journey to figure out the cause of the issue started! Keep in mind that I can’t share actual code, instead I’ll share similar, mock code I’ve created to explain the issue we’ve faced and how we’ve managed to solve it. 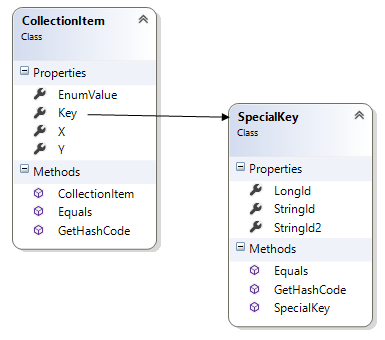 Each item has the following properties: two doubles, an enum and another class. The collection item and the inner class are overriding the equals method and providing a comparison based on property values. To illustrate the problem we had, I’ve wrote a small console application. Creates to different item providers. Sets the items to both providers. Gets the items from those providers. Convert one of the collections to a HashSet. Tries to remove all the items in the HashSet by using the other list of items. Prints the number of items left in the HashSet. If we run this program, we can see right away the problem. So, how should I tackle this? First of all, we need to understand that those collection, although they should be, are not the same object. Let’s start by checking the items I can’t remove in the simpleItemsHash HashSet. 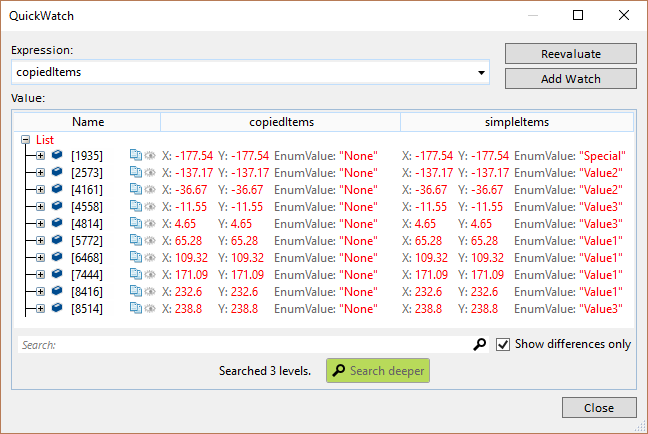 To make my life easier, I’ll use OzCode’s reveal feature, which enables me to preview specific properties in objects, without digging for the data of each item. Checking those 10 items turned out to be not as helpful as I wished, since there is nothing special about them. These values are completely random, and all the values seemed plausible. What now? Let’s check what items are different between the two collection. Great! I see a pattern! 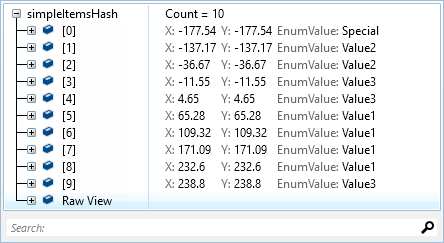 It’s clear here, that items from the copiedItems list with the EnumValue property set to “None” are different. Looks like the CopiedItemsProvider is making trouble for us. Seems like someone decided to change some of the enum values while copying them in the CopiedItemsProvider. Indeed, taking care of this line, fixes the problem. I was pleasantly surprised by how easy it was fixing the collections comparison bug. mostly because of the massive clicking around and code writing it took to accomplish the same exact thing I’ve just did in under 10 minutes.